The ‘India-Russia Bridge for Innovations’. In a bid to bolster bilateral business linkages, Moscow-based Global Venture Alliance has joined hands with Mumbai-based incubator, Society for Innovation and Entrepreneurship (SINE), to launch the ‘India-Russia Bridge for Innovations’ (IRBI). 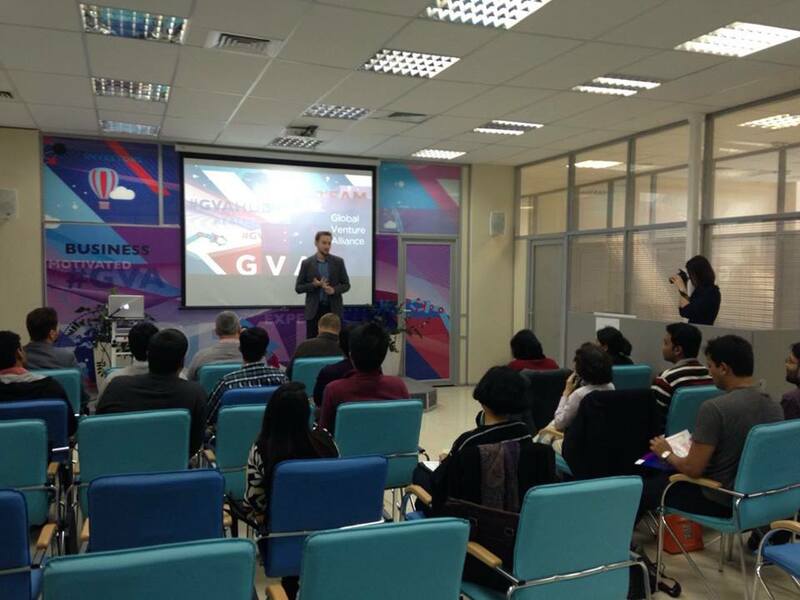 Global Venture Alliance (GVA), a Moscow-headquartered provider of business services, training programmes and seed funding for startups, has teamed up with the Society for Innovation and Entrepreneurship (SINE), a major tech business incubator based in Mumbai, and launched the ‘India-Russia Bridge for Innovations’ (IRBI) on September 17. The BW Disrupt, an Indian online publication, has reported that the IRBI program enjoys financial support from the Indian Government’s Department of Science and Technology. As part of the programme, 10 Indian startups are participating in a 2-week accelerator programme in Moscow. GVA will introduce them to the Russian market for an educational, practical, networking and cultural perspective. Also included in the programme is a visit to Skolkovo, the international tech hub under completion on the outskirts of Moscow. Among the Indian startups coming to Russia are Campus Time, whose mobile app connects students on college campuses; Ecolibrium, which provides Big Data energy analytics; Field Assist, which has developed a mobile monitoring system for on-field sales; Frodo, which is developing an adventure camera; and ShopsUp, which offers a hyperlocal store discovery app with cognitive capabilities. Some medical technology startups are also participating in the venture; among them A3 RMT, Algosurg Products, CareNx Innovations, Medprime Technologies and Transcell Biologics. GVA believes these startups could potentially develop partnerships with Russian businesses in the very short term. Over the past few years, GVA has launched a number of initiatives to develop the Russian innovation ecosystem. In particular, it offers startup acceleration programmes as well as training and networking programs for entrepreneurs and investors. GVA has also launched a seed fund and corporate startup accelerators with such companies as IKEA and Faberlic. GVA currently has permanent offices in Moscow and San Francisco, and claims to have 20 partners in different countries around the world. Russia and India have been strengthening their ties in the field of high technologies over the past years. In September 2014, a delegation of scientists, educators and ministry officials from India paid a visit to Skolkovo on a fact-finding mission to study the opportunities available for Indian students and startups in Russia. A few months later, 15 IT companies from Skolkovo took part part in IndiaSoft, a major industry conference and B2B networking; then Skolkovo and the Electronics and Computer Software Export Promotion Council (ESC) of India signed an agreement to create a cluster of Indian IT firms at the Russian tech hub. Also noticeable is the flow of Russian tech investors to India. Ru-Net, a Moscow-based venture fund backed by Leonid Boguslavsky, invested in several Indian e-commerce companies, including Indian mobile recharge platform FreeCharge in 2014. Another Russian investor interested in the Indian market is Boris Ryabov, managing partner of venture fund Bright Capital. Last year he took part in a $1.7 million round of funding for Indian food delivery service Inner Chef, along with Ukrainian and local investors. In February 2016 AFK Sistema, a Russian LSE-listed conglomerate, launched a proprietary $50-million fund to support startups operating in the technology and niche consumer retail segments in India and other Asian countries. Its latest investment went to QwikCilver, a Bangalore, India-based provider of gifting card solutions. Most recently, Firrma.ru reported that Russian edtech startup ProctorEdu announced its participation in Indian accelerator EDUGILD, in a bid to enter the Indian market. In the field of microelectronics Angstrem — a major Russian player which has just been targeted by US sanctions — will shortly deliver to India, its first export market, new radiation-resistant microchips it has designed for use in outer space. The leadership of both Russia and India is encouraging business collaboration. Most recently, Russian deputy prime minister Dmitry Rogozin met his Indian counterpart, Sushma Swaraj at the 22nd session of the Indo-Russian Intergovernmental Commission on Trade, Economic, Scientific, Technological and Cultural Cooperation (IRIGC-TEC). The two governments hope to expand bilateral trade to up to $30 billion by 2025, BW Disrupt reported. First published by East-West Digital News.